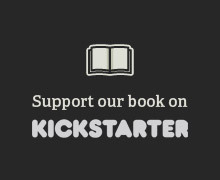 We are excited to announce the launch of our Kickstarter campaign! We are excited to announce the launch of our Kickstarter campaign today! We are making a book that captures the energy and excitement of design entrepreneurs. A book that inspires the design community to Kern and Burn—to perfect our craft and to work obsessively hard. It is a book that focuses on designers’ lives, decisions, and aspirations rather than their techniques and color palettes. A book that challenges our peers to believe in themselves, and think about their lives as a design problem. As we make our way through the 100 Days of Design Entrepreneurship we edit our discussions, curate our interviews, compile essays, reflect on what we’ve learned, and work to craft a book that is as beautiful as our content is rich. The format and narrative of the book will evolve through the process. The book’s title is also in the works, we’ll announce it when the time is right! We’ve adopted the startup mentality and are putting this project out there before it’s perfect, packaged, and ready to ship, (heck, before it even has a title), but we like that. That means we get the chance to involve the design community in our design process, the book’s production, and we get to share the reward of creating something meaningful, together. We’re honored to share our contributors’ stories with our readers. The launch of our Kickstarter campaign marks the beginning of a wonderful collaboration with an even larger community. As always, thanks for joining us on the journey. We would love if you would spread the word!